The band hails to a sound inspired by the early years of Rock & Roll when horn sections were an integral part of the sound that is reminiscent of the times when honking and screaming saxophones fueled the dance floor in night clubs. 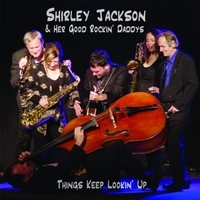 Shirley Jackson & Her Good Rockin’ Daddys have been fuelling the dance floor with a mixture of horn-powered east coast blues. The band hails to a sound inspired by the early years of Rock & Roll when horn sections were an integral part of the sound stylized by Jackson’s own song writing and horn arrangements. The band is comprised of: Shirley Jackson on vocals and tenor saxophone; her son, Jef Wirchenko, on bass (performing, writing, and arranging with the Good Rockin’ Daddys for twenty-five years); long time members Dawn Hatfield (baritone saxophone) and Dave Harrison (trumpet) round out the Good Rockin’ Horn section; and veteran musicians Marc Doucet and Tom Crilley on guitar and Ainslie Jardine drums.